Snooker’s German Masters is set to be played this week, starting on Wednesday the 4th of February and running through to the final on Sunday the 8th. The organisers, World Snooker, experimented last year with taking 64 players to the tournament, but have reverted to the original format this year with 32 players set to compete at the event. The draw is split into four quarters with one semi-finalist coming from each section of the draw. All matches up to and including the quarter-finals are the best of nine frames, with the semi-finals the best of eleven, and the final the best of seventeen frames. All of the usual suspects will be present, and once again, Ronnie O’Sullivan has been installed as the early favourite to take the title. 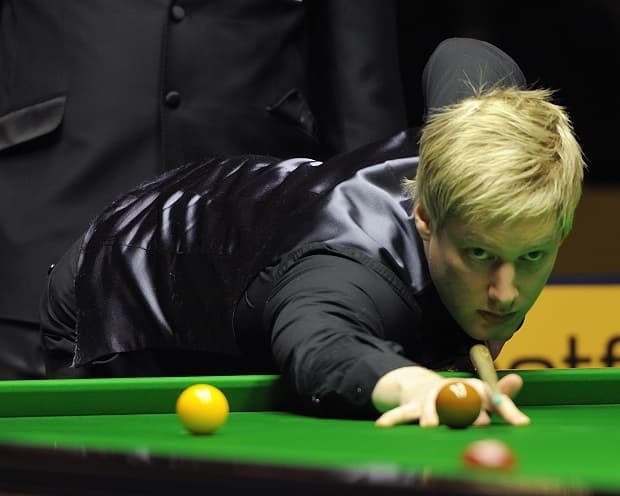 However, for our money, Neil Robertson is the man in form at the moment, and with a decent enough route to the semi’s, he’s our selection to win this latest ranking event. Ronnie O’Sullivan, predictably, is the favourite for the tournament and if he reproduces the kind of snooker he played in the UK Championship he’ll be very hard to beat. However, he doesn’t have the best record away from home turf, and despite winning this tournament in 2012, is worth taking on at the prices. He was beaten by a superb Robertson performance in the semi-finals of the recent Masters at Alexandra Palace, and he has a pretty tough draw here – in the same section as Masters victor Shaun Murphy, along with the likes of Mark Allen, Mark Williams and Joe Perry. Robertson looked to be in the form of his life when he swept aside Ali Carter in the quarter-final and Ronnie O’Sullivan in the semi-final of the Masters, by the same scoreline of 6-1. Many expected him to go on and win the trophy, but he went down to an impressive Shaun Murphy performance and lost by 10 frames to 2. Maybe those two epic victories took a lot out of him and had caught up with him by that point, or perhaps Murphy just raised his game to a very high level, but either way, if the final defeat hasn’t taken too much out of him he could be set for a good tournament here. The draw has been fairly kind to the Australian star, with Stephen Maguire and Barry Hawkins likely to present the biggest danger to a semi-final spot. If he gets to that point, his most likely competition for a final slot will be either Judd Trump or Mark Selby – two players not to be sniffed at – but if Robertson can maintain the form that took him to the Masters final, he shouldn’t be too fearful of either. Trump is next in the betting, and ought to be value enough for at least a quarter-final place, but he’s been in an out of form recently, and his confidence must have taken a huge blow after the final of the UK Championship. He staged an epic comeback from 9-4 down against Ronnie to level the scores at 9-9, only to fall at the final hurdle and lose the game 10-9. The sheer effort that would have gone into that comeback, only to achieve nothing must have been hard to take, and he was subsequently knocked out in the first round of the Masters by Stephen Maguire. If he can pull his form back together he has a chance, but we favour Robertson if the two do eventually meet in the semi-finals. The reigning champion of this tournament, Ding Junhui, is another player who has been in poor form since last year’s heroics which saw him claim five ranking titles in one season. He hasn’t reached a final for some time now, and it would be a leap of faith to back him on the assumption that he can return to his best form. However, the draw has been relatively kind to him, and his main rival for a semi-final spot is Stuart Bingham, so if he can navigate his way through the first few rounds, he’d have a shout at a decent price. Unfortunately his likely semi-final opponent would be either Ronnie O’Sullivan or Shaun Murphy, so that tempers enthusiasm somewhat. Selby is another being offered at a big price, and another who could make a mockery of it if he can recapture his best snooker. Yet again though, his form is not inspiring and if he beats Anthony McGill in the first round, he’d face a second round tie against one of two former greats – Peter Ebdon or John Higgins. Assuming he gets past those, he would more than likely have to beat Judd Trump and Neil Robertson en route to the final, and that’s as tough a ride as he could get. Despite the big odds, he makes little appeal. Indeed, a better outside bet at the prices on offer might be Masters winner Shaun Murphy. He must be on cloud nine after his imperious 10-2 victory over Robertson in the final of that tournament, and comes here in great form. It has to be said though, that the draw hasn’t been particularly kind to the Englishman, and if he wins a first round clash against Michael Wasley, he’ll face a second round tie against either Mark Allen or Mark Williams. Were he to succeed there, it would probably set up a quarter-final clash against Ronnie O’Sullivan, and that’s a tough route to the semi’s. It also has to be said that it’s not easy for any snooker player to win back-to-back tournaments, and after the sheer effort and emotion he must have expended in the Masters, it’s hard to fancy him here.